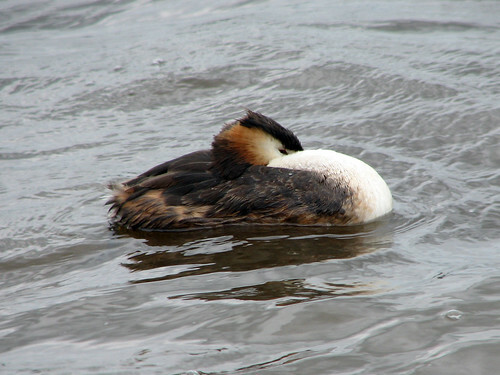 In preparation for the trip, I checked the blog of a Dutch birder who frequently visits Starrevaart. 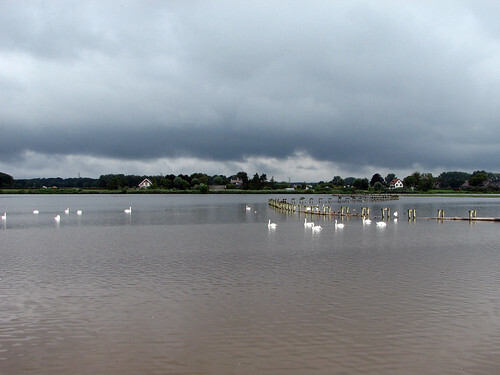 I was shocked to read that the bird hide there had burned down in June 2009. It was a total loss! 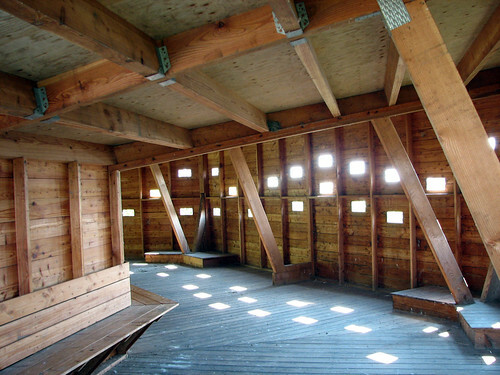 But then I was pleasantly surprised to read that a new hide was built just a few months later. Phew! 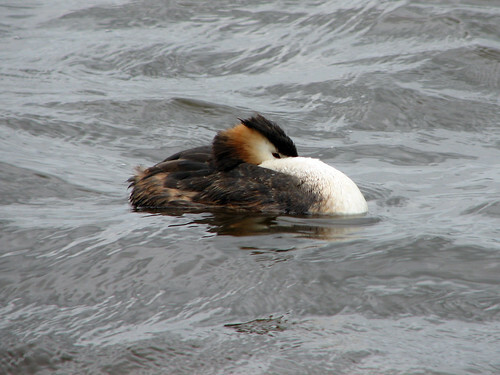 It’s a sturdy little hide, very similar to the previous one. 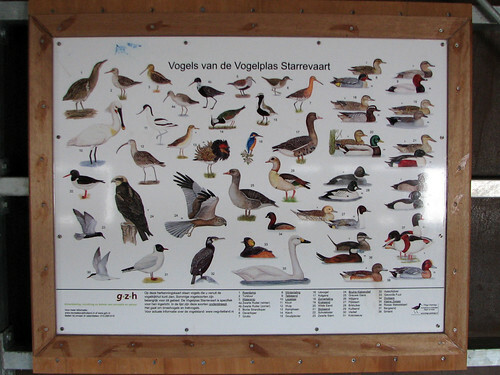 A nice addition was a site-specific bird ID poster. 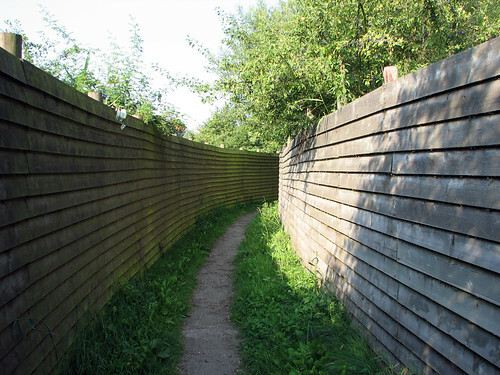 Of course, the wonderful view as just about the same as we remembered it. 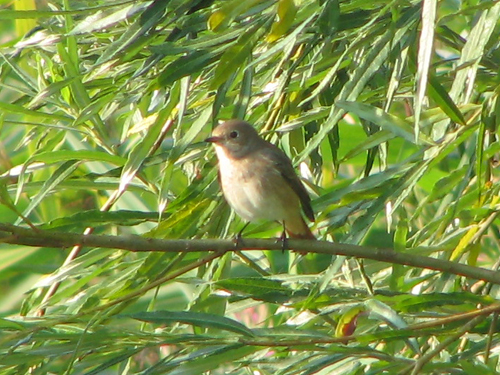 It was great to go back to one of our old regular birding spots and sit for a while, quietly watching the birds. 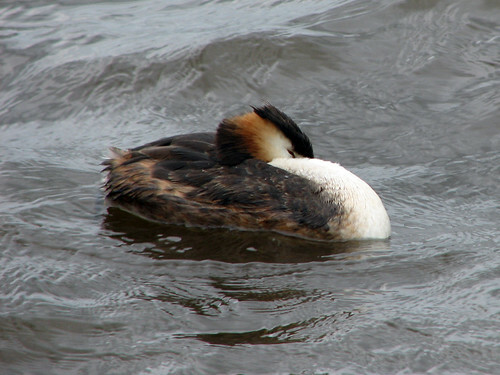 One of my favorites was a Great Crested Grebe having a nap on the choppy water. 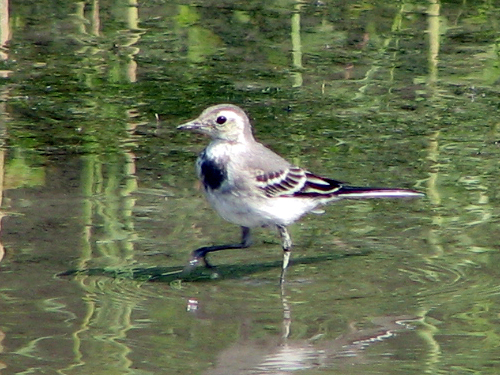 I also took a short video of this weary bird. 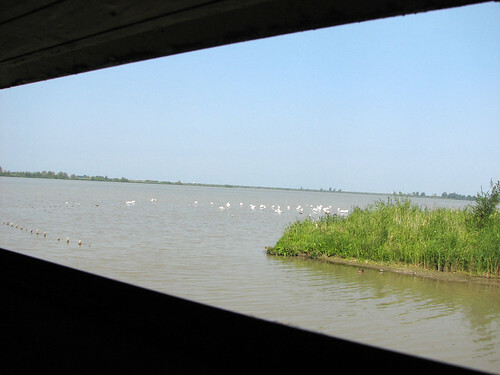 One of the last places we visited on our auto-tour of the Oostvaardersplassen on August 14 was a blind called de Grauwe Gans (the Greylag Goose). 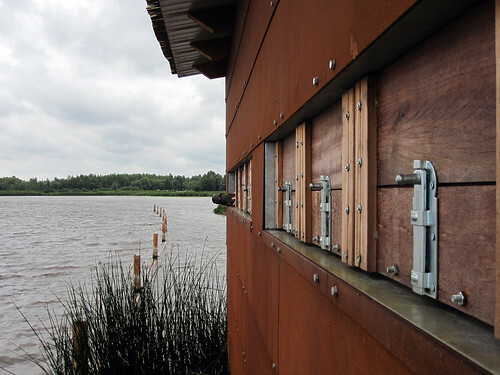 This little palace of birding is everything a bird blind should be, in my opinion: functional, comfortable, and perfectly located to view birds. 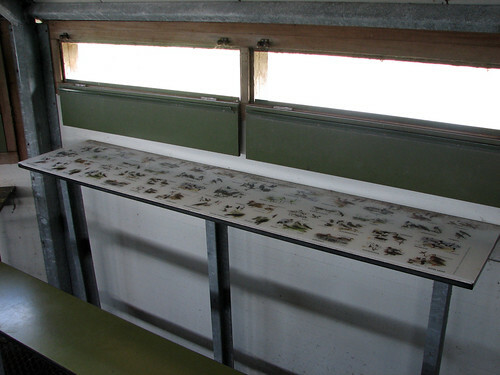 While this blind is very nice, it’s not atypical of Dutch or European bird blinds I’ve visited. I have not seen anything like it in the U.S., so far. 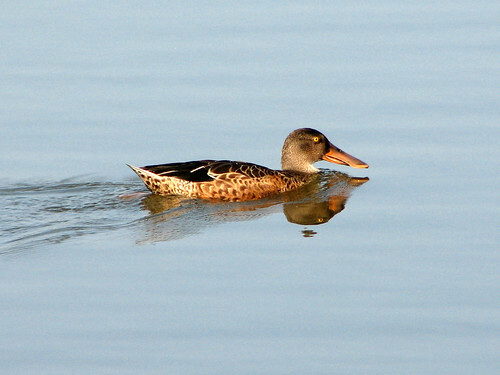 I’ve created a Flickr pool for photos of bird blinds or bird hides. 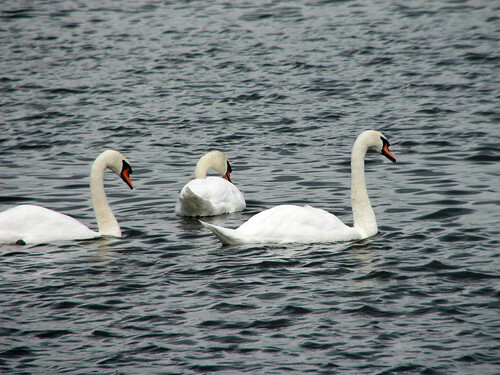 There are 279 photos in the pool now, and I’d love to have more! 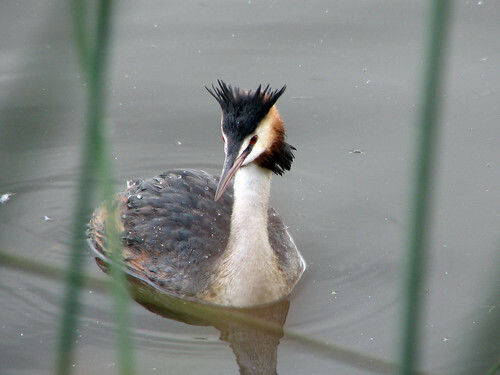 Please have a look and submit your appropriate pictures to the Bird hides / bird blinds pool on Flickr. 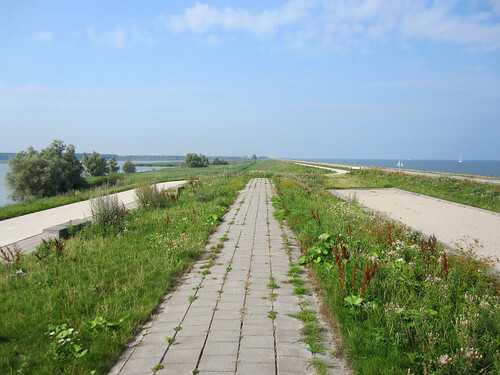 After visiting the Lepelaarplassen and stopping a couple of times on the Oostvaardersdijk to view birds (see part 1), Arthur and I continued on to a few bird hides around the Oostvaardersplassen. 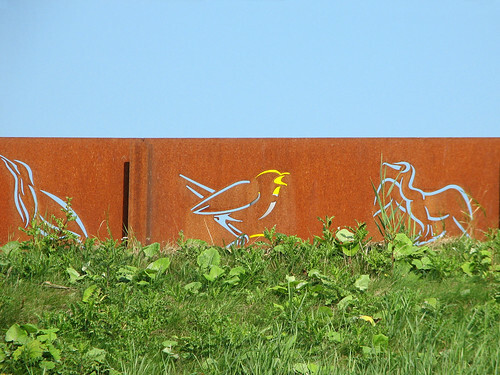 Along the dike, decorative metal fences pay homage to the birds of the area. 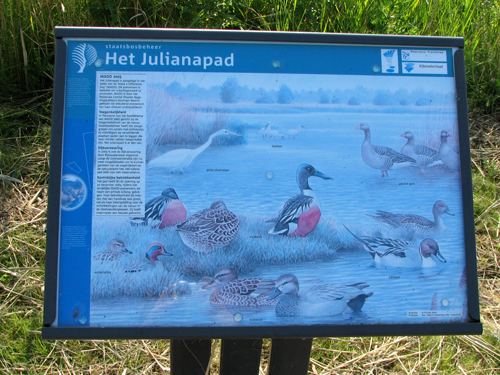 Our first stop was the hide along the Julianapad on the northeast side of the Oostvaardersplassen. 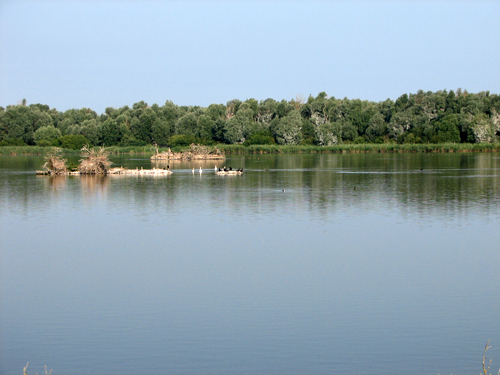 Most of the hides and observation points in this area are very nicely signed. 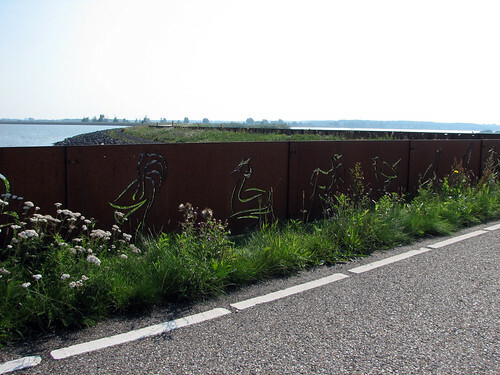 This illustration gives you an idea of the birds you might see from the hide. 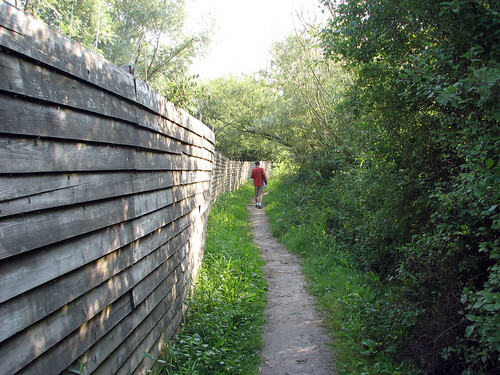 The hide at the end of the path is an open building, with lots of openings facing the water at different heights. 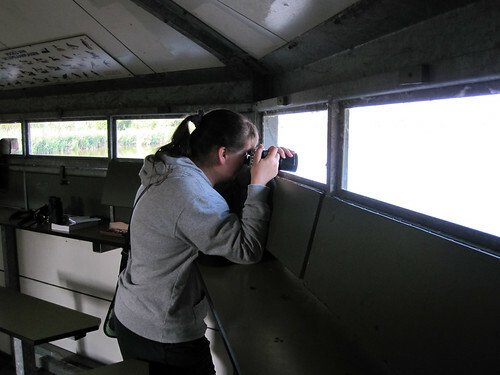 Unfortunately there were hardly any birds to view from the hide. 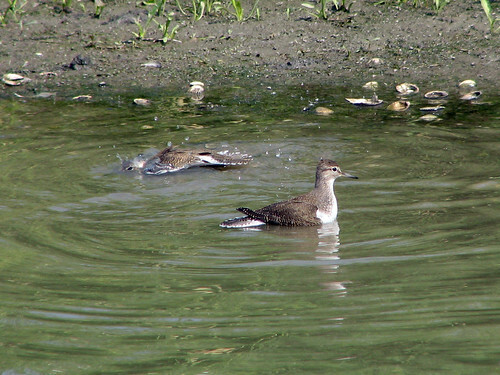 I didn’t mind too much, as there were birds to watch inside the hide. 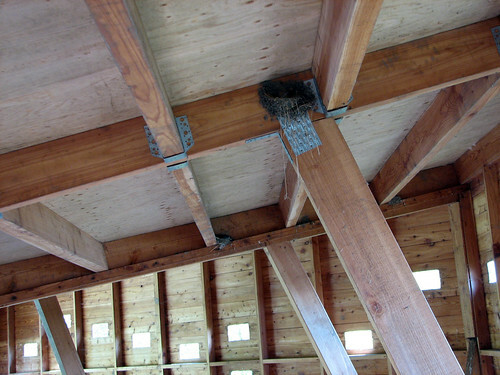 There were half a dozen Barn Swallow nests in the rafters of the hide. 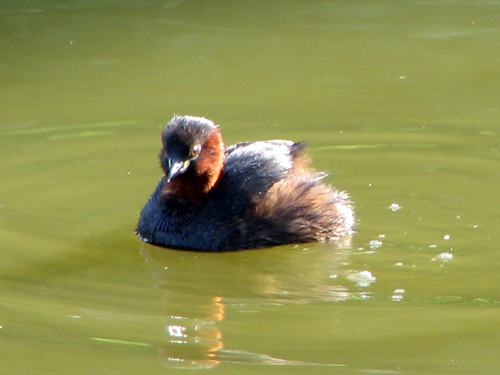 Most were empty, but two held nestlings. 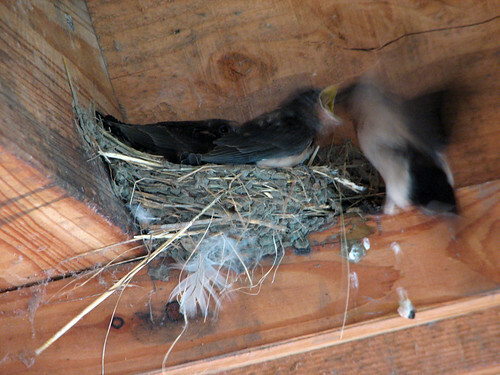 Parents provided food to the nestlings in the blink of an eye. 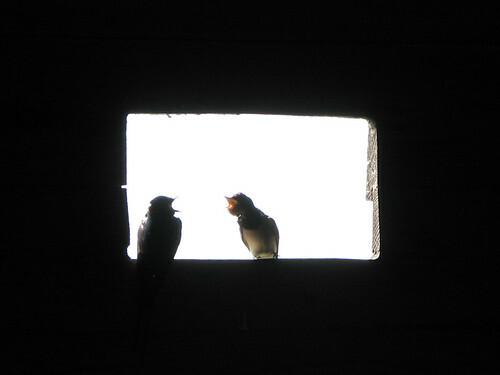 Youngsters also sat in one of the windows, watching adults outside hunting and begging when the adults approached them. 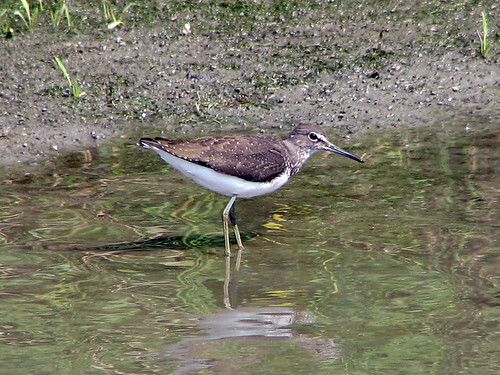 After this, we headed back to the car to visit, you guessed it, more bird blinds. 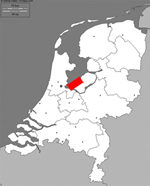 Read all about in Part 3. 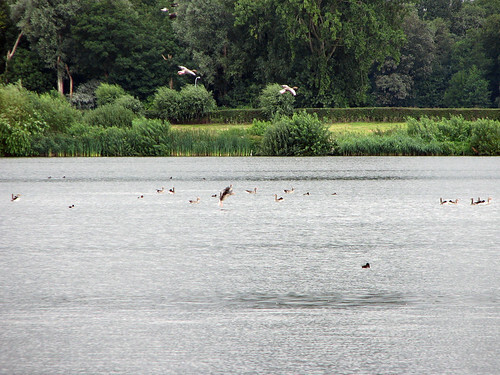 On August 15th Arthur and I visited one of our favorite birding spots, Vogelplas Starrevaart. 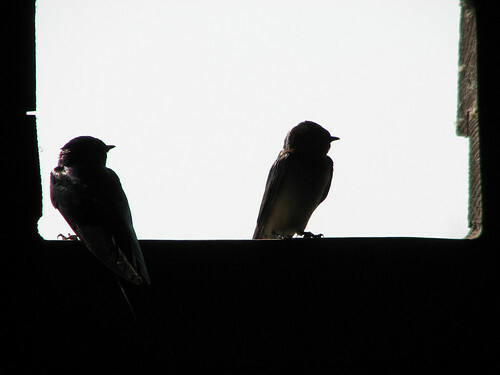 We spent some time watching birds from the blind. 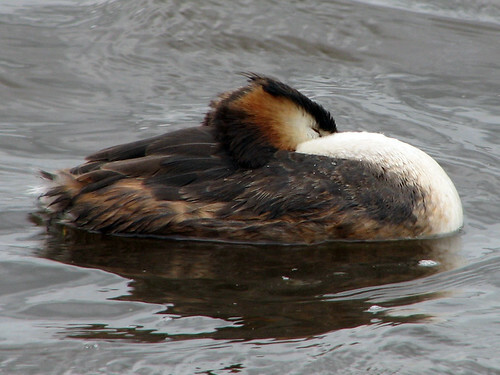 This Great Crested Grebe having a nap on the water was one of the birds we saw. 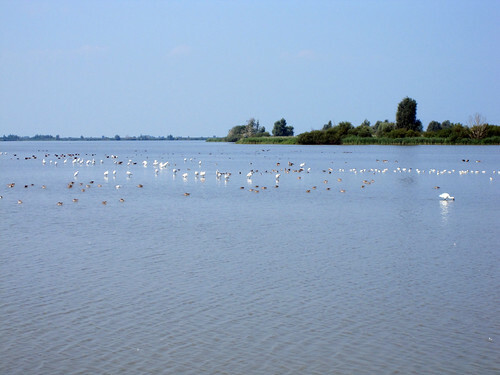 The Dutch organization Natuurmonumenten has created a bird hide which is accessible for wheelchair users, in cooperation with the Friese Poort College in Drachten. 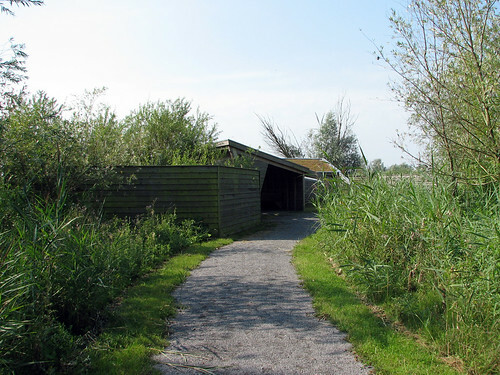 The hide is located by the Zuidwest (southwest) lakes in the Fochteloërveen natural area. 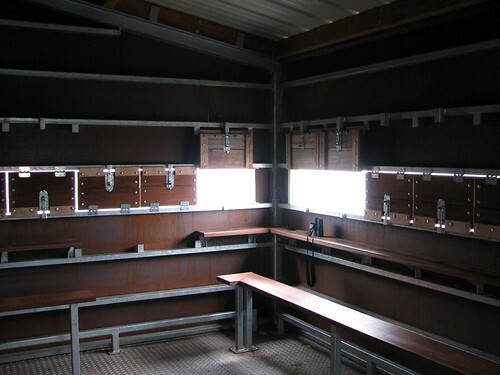 The construction is large enough to be sure that wheelchair users can move around the hide easily. 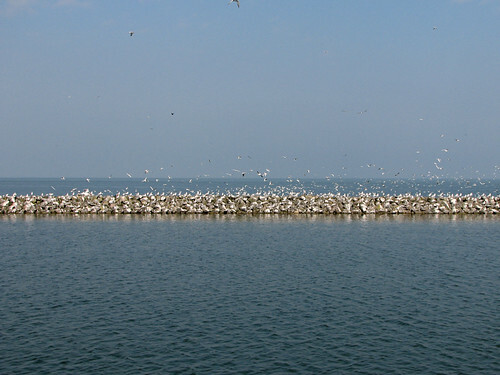 The lookout points are on different levels so wheelchair users can use them as well as bird enthusiasts who arrive on foot. 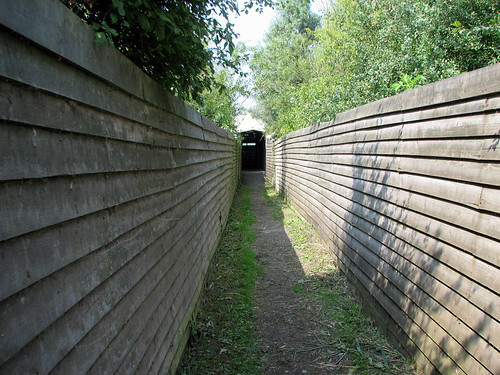 Four students worked for approximately two months to build the hide, which was tested by wheelchair users and a forest ranger soon after it opened. 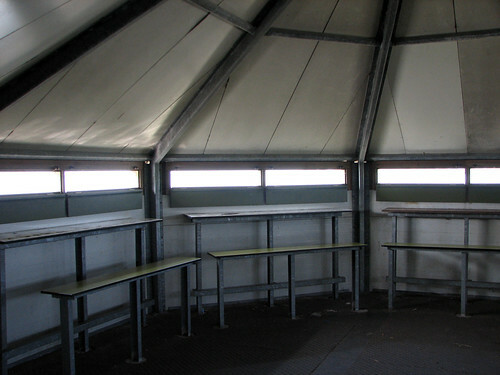 Some users reported difficulty entering the hut, so the students will adjust the doorway for better future use. 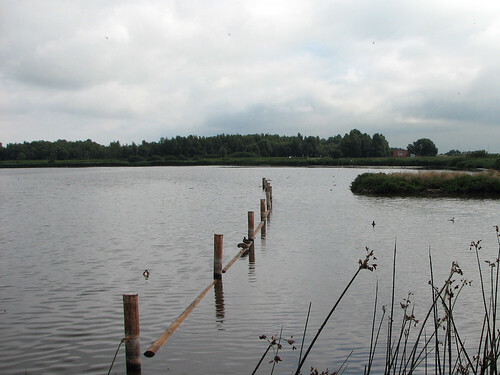 The Fochteloërveen is already equipped with a wheelchair accessible path and observation tower. 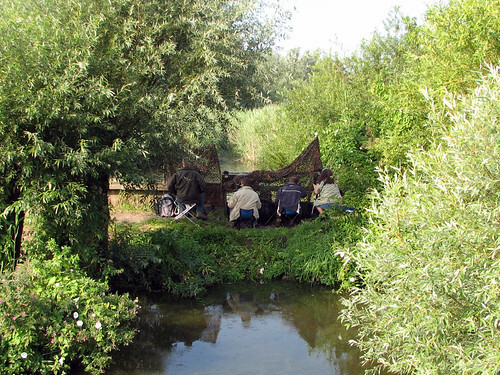 Natuurmonumenten is organizing an excursion to the park for wheelchair users on 17 June.